Last year we saw the release of Google’s very own Nexus 7 tablet, Google have now re-released the Nexus 7 tablet, but with a makeover. The Nexus 7 tablet has had a few minor upgrades and has been put on a diet. Compared to the old Nexus 7 the new one is slimmer, taller, and thinner. The device is also lighter in weight. The new Nexus 7 boasts a higher screen resolution than it’s predecessor, the old resolution being 1080x800 and the new being 1920x1200, other features that are new to the device include 4G network connectivity, which is only available in 32GB and the device will cost more, and a 5MP rear facing camera. Wireless charging has also been added to the Nexus 7, just like the Nexus 4 handset which utilises wireless charging you will need a compatible charging dock. The Nexus 7 is available at £199 for the 16GB model and £239 for the 32GB model, $229 and $269 US.The 32GB LTE model will cost $349 US, this will be in the region of £329 in the UK. 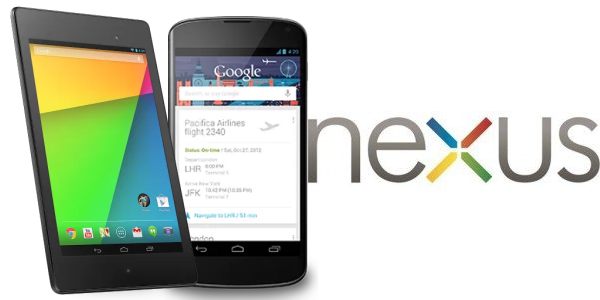 Along with the release of the new Nexus 7, Google have slashed the prices for the Nexus 4 mobile phone. You can now pick up an 8GB Nexus 4 for £159 and the 16GB will only set you back £199, $199 and $249 US. Will you be picking the new Nexus 7 tablet? Thoughts on the Nexus 4 price cut? Please leave your comments below.